Xiaomi has officially announced the launch date for its upcoming flagship phone, the Mi 6. Recently, the company's CEO, Lei Jun had confirmed that the device would be launched in April, but he didn't say when. Then a rumour floated around yesterday, about a possible launch date announcement scheduled for today, which many top blogs misread, and claimed that the Mi 6 will be launched today. Xiaomi took to its forums and social networks in China, to announce that the Mi 6 will be unveiled on April 19th, in Beijing. 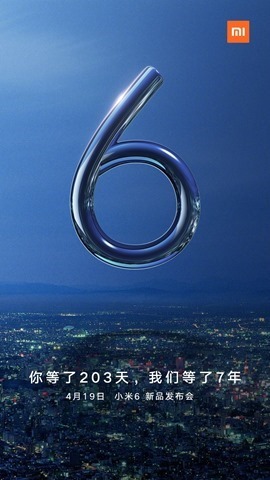 As you can see from the image featured here, the number 6 is in a shiny metallic design. This is a possible teaser which reflects that the Xiamoi Mi 6 will have a premium metal design. A leaked Xiaomi Mi 6 benchmark on AnTuTu. hints that the phone, is codenamed Sagit and reveals the technical specifications. The device will feature a Full HD 1080p display, which if true, will disappoint fans of VR (2K offers a better resolution for virtual reality). The Mi 6 will be powered by a Qualcomm Snapdragon 835 processor with 4GB of RAM, an Adreno 540 GPU and 64GB of internal storage. The phone will ruun on Android 7.1.1 Nougat with the company's MIUI skin on top. The Xiaomi Mi 6 will sport a 12 megapixel rear camera and an 8 megapixel front camera. 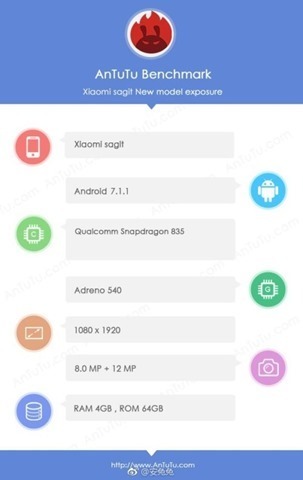 We will know for sure if these specs are true, when the Xiaomi Mi 6 launches on April 19th.